Eggs are one of my favorite kitchen beauty ingredients. A simple egg white face mask is a quick, inexpensive way to get an instant facelift! 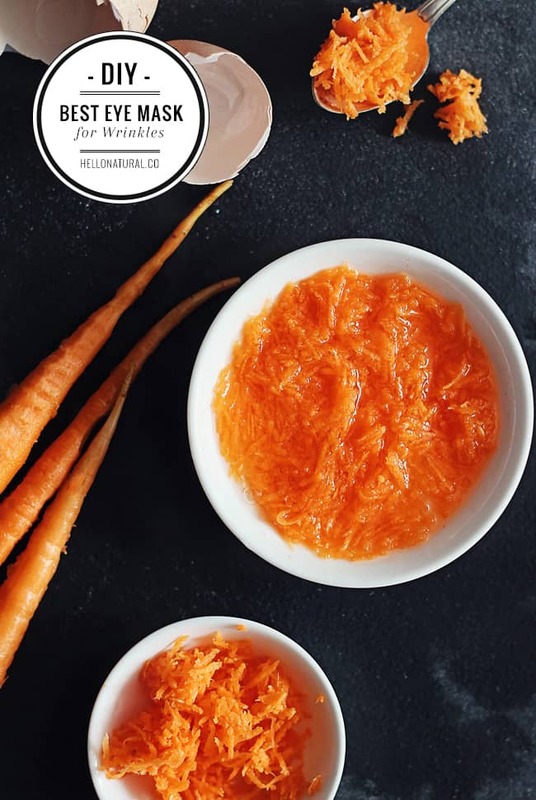 Combining carrots and egg whites doubles the wrinkle fighting power in this DIY eye mask (which you can totally use all over your face, too). The vitamins and proteins in egg whites tighten and firm the face, making them especially effective on pesky crows feet around the eyes. And carrots are a natural way to get retinol, one of the best wrinkle-fighting ingredients. The beta-carotene in carrots is converted to retinol when applied to the skin, helping to regenerate cells and soften skin, making this the best eye mask for wrinkles! Combine egg white, carrot and aloe vera in a small bowl. Beat mixture together with a fork until frothy (about 1 minute). With clean hands or a brush, apply the mask around and under the eyes. Avoid the eyelids because you don’t want to get it in your eyes. You can also apply to the mask to your entire face, if desired. Let the mask dry for at least 15 minutes or up to 30 minutes. You will definitely feel the mask tightening your skin! If it gets uncomfortable, go ahead and remove it. Use a soft, wet towel to gently clean off the mask. Finish with moisturizer. What’s your favorite wrinkle-fighting treatment? I have some left-over – I should toss that right? Or is it good for a day or something? Thanks! Does this really work? I need something that will get rid of or lessen my wrinkles.